Get those DVRs and HTPCs ready – it’s here. Each week GeekTonic covers the TV scene with a complete listing of premieres, finales and specials for the week. This week is pretty much the busiest premiere week of all. There is a LOT of TV beginning which means this is basically the official start of the Fall 2010 TV Season. Ultimate Guide - The Fall 2010 TV Season – All TV Premieres by date along with a few PDF downloads to take along. TV Premiere Calendars – All US Nets and Big 5 Broadcast Nets – Same Google Calendar as above but only the main broadcast network premieres included. Boardwalk Empire (9pm on HBO – Available in HD) – New series on HBO that almost makes me want to re-subscribe to HBO. I watched an extended clip from the pilot episode and consider this one of the best bets of the season. The story is of prohibition-era Atlantic City with the first episode written by Martin Scorsese. If you have HBO do not miss this series. And if you don’t have HBO you may consider subscribing or save this one in your Netflix queue. Dancing with the Stars (8pm on ABC – Available in HD) Season 11 starts off with a two-hour premiere. Bristol Palin is on this season. Yes, no matter what your politics this is a sure sign that the world is coming to an end. The Event (9pm on NBC – Available in HD) New series for NBC with a familiar theme – A conspiracy thriller where a regular guy investigates the mysterious disappearance of his fiancée and unwittingly begins to expose the biggest cover-up in U.S. history. I personally will be recording this one with a wait-and-see attitude. I like what I’ve seen so far about the show & the lead actor Jason Ritter should be good in this one. But I’ve been burned too much with shows like this and would prefer to make sure it will continue before investing in it.. You know like Flash Forward for instance. Lone Star (9pm on Fox – Available in HD) This is another new series to check out in my opinion. I had the opportunity to watch an extended clip from the season 1 premiere of Lone Star and it was definitely something that caught my eye. The story of this show involves a smooth-talking con man and his dad both of which have been running scams for years. The son lives a triple life (two of them fake) and wants to build a new, less dubious life. David Keith portrays the father in this show which has a premium cable feel to it. I definitely recommend you check this one out. Mike & Molly (9:31pm on CBS – Available in HD) A new comedy series for CBS. I watched an extended clip of the season premiere from this show and came away pleasantly surprised. I expected very little from this one, but found it to be quite funny. It’s about an overweight cop and a fourth grade teacher who meet at an overeaters anonymous meeting in Chicago and fall in love. Yeah, that plot didn’t appeal to me either, but after watching much of the premiere I gotta say it actually looks pretty good. Chase (10pm on NBC – Available in HD) New series by Jerry Bruckheimer where a team of U.S. marshals hunt down America’s most dangerous fugitives. I haven’t heard good things about this one. Hawaii Five-O (10pm on CBS – Available in HD) New series that is a re-make of the popular show that aired from 1968 to 1980 (wow). It’s being re-cast with an elite unit/task force set up to fight crime in Hawaii. I saw a short clip of the premiere episode and it was okay. Might be worth checking out as it’s following the formula of the quite successful show that preceded it. Warehouse 13 (9pm on SyFy– Available in HD) – Season 2 finale. And we received news that there will in fact be a season 3! Running Wilde (9:30pm on Fox – Available in HD) A new series where A spoiled rich boy tries to buy the love of his childhood sweetheart, an idealistic do-gooder. The show was created by “Arrested Development’s” Mitch Hurwitz and stars that same shows Will Arnett. The previews didn’t look too good and the reviews have been very lackluster. The Middle (8pm on ABC – Available in HD) Season 2 begins with a little “Everybody Loves Raymond” reunion of sorts. Undercovers (8pm on NBC – Available in HD) A new series with a retired husband-and-wife spy team who now run a catering business are suddenly thrust back into their former CIA agent lives. Better With You (8:30pm on ABC – Available in HD) A new series with two sisters (Jennifer Finnigan, Joanna Garcia) have very different relationships with their significant others. Law & Order: Special Victims Unit (9pm on NBC – Available in HD) Season 12 begins with Lost’s Henry Ian Cusick guest starring. Modern Family (9pm on ABC – Available in HD) Season 2 brings back the comedy. After getting a comedy win at this years Emmys they start this episode with Phil finally agreeing to sell that station wagon. My pick for best comedy on the air. Cougar Town (9:30pm on ABC – Available in HD) Season 2 begins and I’m told it isn’t about “cougars” all that much any more for what its worth. This first episode brings a “Friends” reunion of sorts as Jennifer Aniston guests stars along with lead Courtney Cox. The Whole Truth (10pm on ABC – Available in HD) A new legal drama that chronicles how a case is built from the perspectives of both the defense and the prosecution. Community (8pm on NBC – Available in HD) Season 2 begins with Betty White guest starring. My Generation (8pm on ABC – Available in HD) A new series that’s sort of a mockumentary. Plot is like this: A documentary crew followed high school students as they prepared for graduation in 2000. Ten years later, the filmmakers revisit the former classmates. The Big Bang Theory (8pm on CBS – Available in HD) Season 4 premiere begins with Sheldon going on his first date ever – with Amy Fowler. $#*! My Dad Says (8:30pm on CBS – Available in HD) A new comedy based on that Twitter account so many of us follow. An adult son moves in with his father (played by William Shatner) who is not afraid to express his not politically correct opinions. It looks bad to me – really bad. 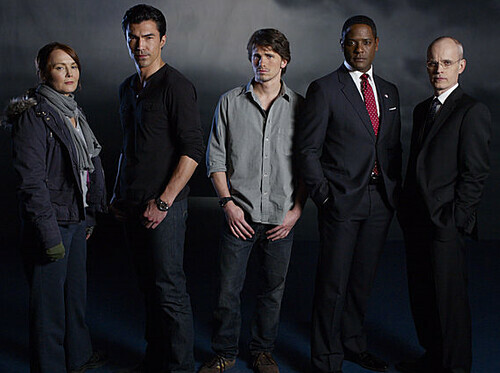 Fringe (9pm on Fox – Available in HD) Season 3 brings back some pretty crazy plot action. My favorite sci-fi series in a while. Grey’s Anatomy (9pm on ABC – Available in HD) Season 7 begins with a wedding. The Office (9pm on NBC – Available in HD) Season 7 begins with Kathy Bates returning as company main woman. Sharktopus (9pm on SyFy – Available in HD) Made-for-TV movie. What a title! Extreme Makeover: Home Edition (8pm on ABC) Season 8 premiere with Katy Perry, Shaquille O’Neal and other notables. The Amazing Race (8:30pm on CBS) Season 17 begins at 8:30pm and then on 10/3 moves to 8pm. 11 New teams. The Cleveland Show (8:30pm on Fox – Available in HD) Season 2 begins with Kanye West guest starring. Desperate Housewives (9pm on ABC – Available in HD) Season 7 begins with a new Housewife – Vanessa Williams who should fit right in.